Silfra fissure is the only place in the world where you can dive between two continents and this is the most extraordinary experience. This is one of the most desirable snorkeling spots on earth! What Makes Silfra Fissure So Unique? How to get to Silfra? What Type Of Activity Best Suits You? How to put on a drysuit? 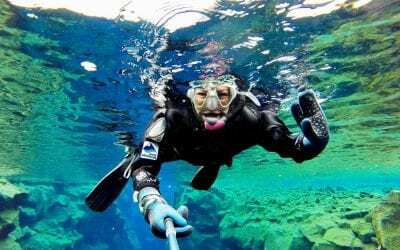 What Should You Bring Along For Snorkeling Or Diving At Silfra Fissure? Iceland’s Silfra Fissure is located within the heart of Thingvellir National Park (Þingvellir) where the North American and Eurasian tectonic plates have been moving apart at the rate of 2 centimeters per year. In 1789, a major earthquake took place in the Thingvellir area and opened up several fissures. Only Silfra Fissure was filled with the glacial meltwater from the nearby Langjokull glacier, this is why it got the name “Silfra,” meaning silvery. Exploring the sub-aqua marine world of Silfra will reveal rock formations which are simply incredible. There are four sections to the fissure: the deep Silfra Crack where you can have your photograph taken between the continents, Silfra Hall which is majestic, the expansive deep blue world of Silfra Cathedral and Silfra Lagoon with its amazing underwater visibility. Silfra is in Thingvallavatn (or Þingvallavatn), the lake at Thingvellir. Although fish seldom venture far into Silfra fissure there is an abundance of colorful marine algae including the famous bright green “troll hair.” The countless shades of jewel-like blue and green make this location marvelous for snorkeling and diving, and these activities are the only ways you can truly experience Silfra’s magic and awesomeness. 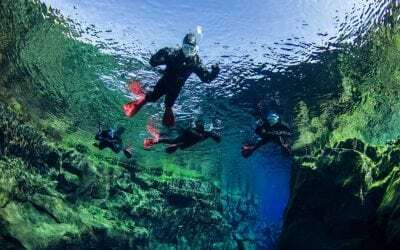 According to the Professional Association of Diving Instructors (PADI), Silfra Fissure is ranked as one of the top 10 best diving sites in the world as the vivid colors seen throughout a dive or snorkeling are breathtaking. Iceland sits on the Mid-Atlantic Ridge where two divergent tectonic plates slowly rip apart. It was about 150 million years ago that Eurasian and North America started diverging while lava from underneath the Earth’s crust was being pushed out to the Atlantic Ocean. When lava met the cold ocean water, it was hardened then being pushed higher by the continuous flow of magma from beneath. This process formed the Mid-Atlantic Ridge and later on, the island of Iceland. One of the notable features about the Mid-Atlantic Ridge is that a deep rift valley is visible above sea level in Iceland, and you can see it in Thingvellir National Park as it’s the only place in the world to see such a geological spectacle. Silfra Fissure is a rift formed within this incredible feature and when you place yourself at Silfra, you are literally standing between two continents. The crack between two tectonic plates in Iceland causes frequent volcanic activities that formed and shaped a diverse range of amazing sceneries and landscapes in the area. The water at Silfra Fissure is completely pure and clear. Its exceptional visibility can extend to over 100 meters (328 ft). Silfra’s water is essentially the meltwater originated from Langjokull glacier about 60 km (37.2 mi) north. It slowly flows into Silfra from beneath the ground after a lasting journey through the porous underground lava field in the area. Before the meltwater flows into the fissure, the lava field acts as a natural filter for the glacier meltwater to filtrate anything that could impair its crystal clarity. It takes 30 to 100 years for the meltwater to travel through about 50 km (31 mi) in the lava field, which is considered the finest filtration method on planet earth. The water is rich with volcanic minerals and is so pure that you can drink it. Such outstanding visibility is further enhanced by the all-year-round low water temperatures that are between 2-4 °C (35 to 39°F) because the natural spring travels underground and does not freeze at its source, it’s able to maintain a constant temperature range. Furthermore, when the pure natural spring flows into Silfra, it’s strong enough to create a gentle current that keeps the water from being static. It’s another major reason for Silfra to have such excellent visibility since the flowing clear water never becomes dirty. The gentle force of the current is helpful for snorkeling at Silfra, too. It makes a meditation-like, effortless snorkeling experience in which you can rest on the water while the slight current takes you to its natural course along the fissure. These amazing factors together make Silfra Fissure an unrivaled snorkeling and diving location in the world. Silfra Fissure is located at Þingvellir National Park about 53 km (33 mi) from Reykjavík and about 171 km (106 mi) from Vík. 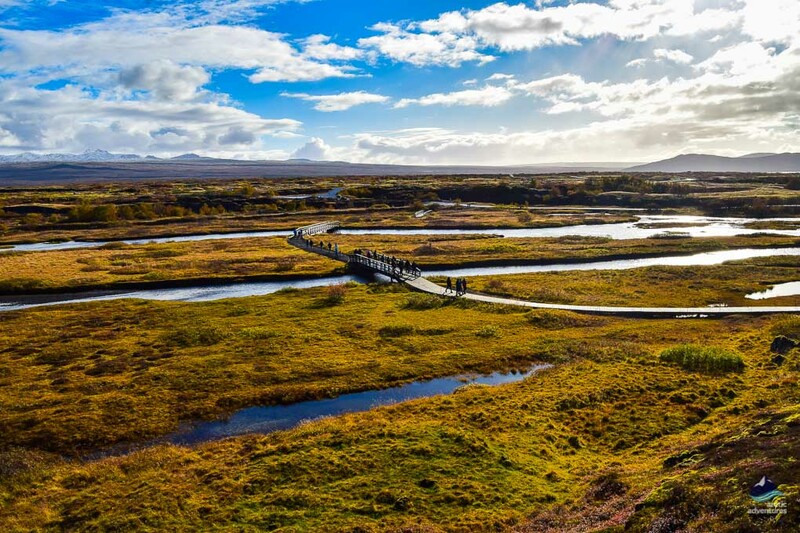 Þingvellir National Park is one of the three stops making up the Golden Circle and once you are at Silfra you are only 63,2 km (39 mi) away from Gullfoss and 53,5 km (33 mi) away from Geysir. Driving from Reykjavík to Silfra fissure is a short drive only about 50minutes through the town of Mosfellsbær and up the valley Mosfellsdalur, past fields of horses and Lake Þingvallavatn until making a turn once down to the lower plane of Þingvellir. Driving from the East to Silfra fissure you will be driving along the South Coast and once you have entered Selfoss, the capital of the South you make a turn into road 35 marked Laugarvatn. Your next turn is on to road 36 leading the way to Þingvellir past Lake Þingvallavatn. Driving from the North to Silfra fissure you will be passing through Borgarfjörður and likely going to want to go the shortest way there. The quickest way there is through the Hvalfjarðargögn tunnel and back into the capital area and through Mosfellsdalur back towards Þingvellir. 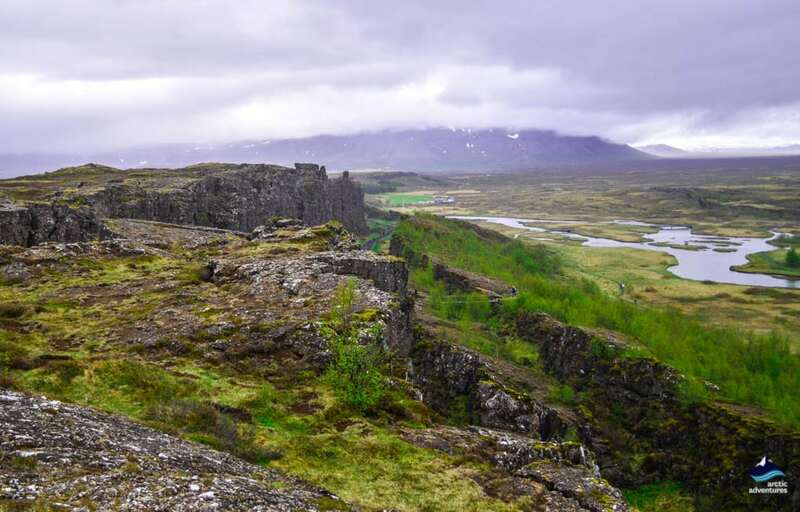 If you don’t have a rental car there are plenty of tour options taking you to Silfra fissure for a day of adventures. See the Silfra tour options below! Snorkeling in Iceland is a captivating activity that has so many indescribable, exciting features. Silfra, as the most unique site, has unparalleled advantages. The lure of snorkeling in Silfra Fissure is the thrill of experiencing something so amazing on each move, while the depths of the earth gaze at you mysteriously. Once it’s been said that snorkeling in Silfra Fissure is like flying, like a meditation in the remarkably blue and astoundingly pure water. In the water, you look at your surroundings completely differently; the sense of familiarity with land retreats while an unusual but amazing underwater sensation starts to take over, you feel weightless and perfectly free. At Silfra, where the two continents being made, you are essentially swimming in the opening of the earth. You are in an uncommon natural setting where the rest of the world becomes so quiet that you could only hear your heartbeats as you drift forward. It’s the ultimate highlight of traveling in Iceland. Iceland, the land of fire and ice, is not only famous for its epic and cinematic landscapes and the indescribable wild nature, but also for the renowned spot for divers from all over the world. Silfra Fissure in Thingvellir National Park is an unbeatable choice when it comes to geology and visibility. 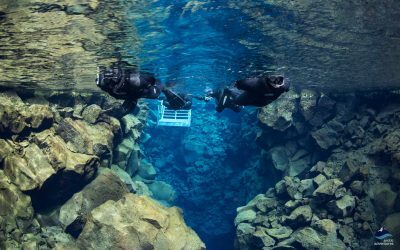 The submerged adventure of diving between tectonic plates is essentially taking the divers close to the ravine between two continents where you can stretch your arms to touch the borders of Eurasia and North American Continents. The water in Silfra Fissure has the greatest underwater visibility than any other diving spots in the world. 10 to 30 meters (32 to 98 feet) are the most common visibility range for most popular diving sites globally, and Silfra Fissure exceeds 100 meters (328 feet). Some even say that the visibility can be far greater than that only if the fissure was long enough to testify! Silfra is still in the making due to big or small changes in the area, which can further widen the fissure or reshape the underwater terrain. 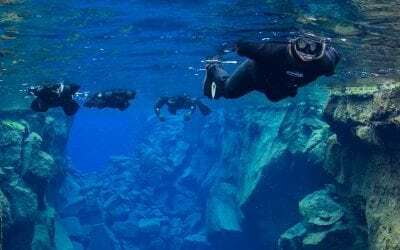 Many experienced divers would rank Silfra as a top 3 diving location after they tried out other diving spots around the world. The unique geological feature, the slight current, the indescribable colors of algae, and the exceptional visibility together make Silfra a diver’s paradise. Due to the constant flow of the natural spring coming from underground, the temperatures of the water at Silfra remain stable between 2-4 °C (35 to 39°F), making the snorkeling and diving activities possible all year round. But there are a few tips we would like to share with you the best time to do those activities at Silfra. June to September at Silfra have the best conditions for snorkeling and diving because the onshore temperatures are higher and it feels more pleasant than in winter. Situated at a latitude of 64°N, Iceland has more daylight hours in summer. More daylight hours means a better chance to have a pleasant sunlight condition that enhances the visibility in the water. Winter in Iceland has fewer daylight hours – the daylight only lasts for 4-5 hours between November and February. As a result, there are fewer tours available daily than in summer. The upside about visiting Silfra in winter is there are fewer crowds, and winter’s serene vista is completely other-worldly at Silfra. 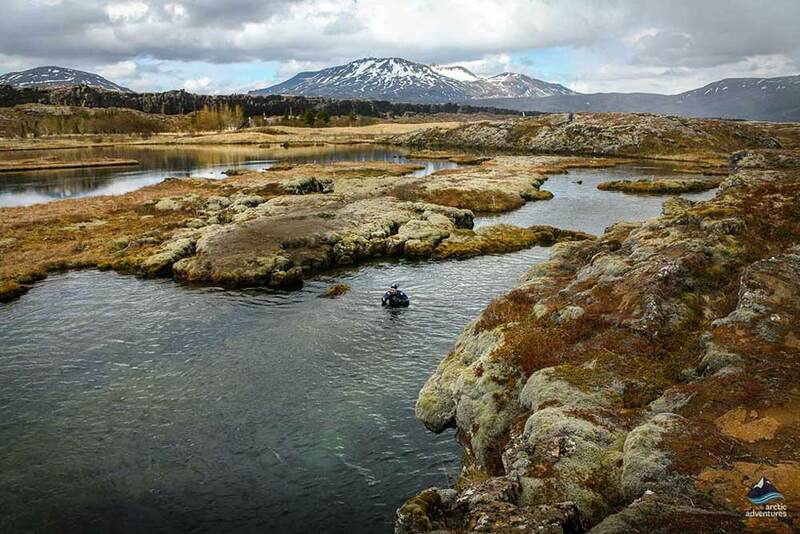 It doesn’t really matter if the winter temperatures are relatively lower as long as Silfra’s water temperatures remain stable throughout the year. Snorkeling and diving are two popular activities at Silfra that are operated all year round. Snorkeling in an underwater canyon in the crystal clear water that takes you into a magical and colorful sub-aquatic world is absolutely a once-in-a-lifetime experience! 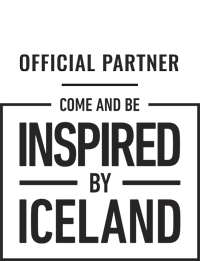 It’s very enjoyable and is considered 3 out of 5 in the level of difficulty. It offers an exceptional opportunity for anyone who is either serious snorkelers or beginners as long as you feel comfortable in the water and know how to swim. Planning a romantic trip or an exciting family day at Silfra sounds brilliant. The geological singularity is a natural, romantic backdrop for you to drift in the crystal clear water and enjoy the enchanting moment – it’s one of the kind. 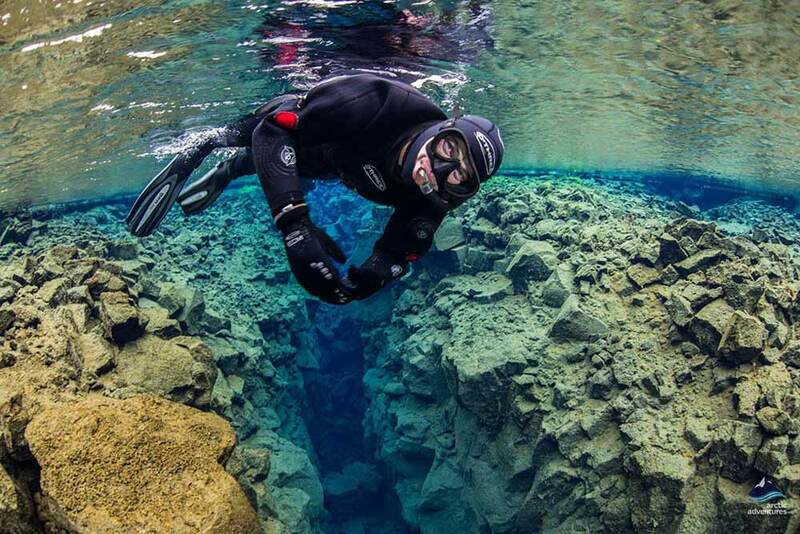 Silfra has earned legendary status among the international dive community. It’s where the two continents split further away and where two worlds collide. If you are a purposeful, experienced diver, you must not miss Silfra. Being on top of many diver’s bucket-list, Silfra’s exceptional visibility literally enhances the diving experience and makes it so much more captivating, and you are brought so close to the underwater world between two tectonic plates. If you are uncertain about your abilities regarding diving in Silfra water then snorkeling is the best option and nothing short of fantastic. At Silfra, snorkeling is usually done in dry suits. Because it best guarantees the snorkelers the most comfortable experience in the glacial water. After being fully geared up, your snorkeling guide will take you to an unparalleled floating adventure in the clearest water in the world. 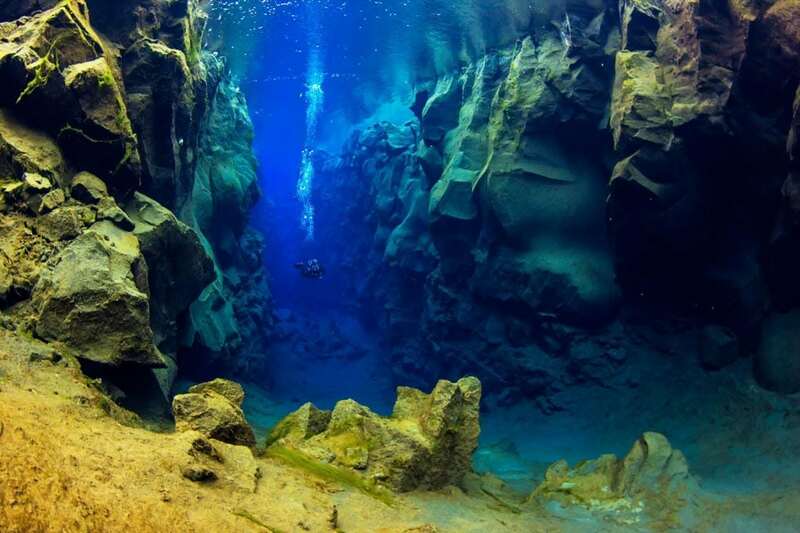 Snorkeling between tectonic plates is billed as the most charming and romantic experience Silfra Fissure can offer. 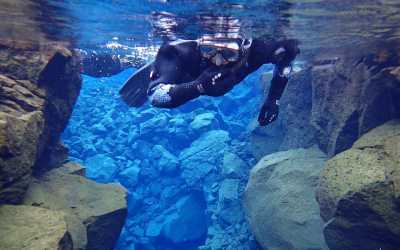 At Silfra, all snorkeling and diving tours are operated in dry suits due to the cold temperatures of the glacial water. In order to comfortably participate in snorkeling or diving tours, you need to bring the following pieces of clothing with you. The first layer of clothing should be able to keep you warm and flexible. You can wear a thin thermal layer in wool, fleece or synthetic, and warm socks made of wool, fleece or neoprene. Due to the underperformance of cotton in this situation, it’s not recommended to wear layers made of cotton. Also, if you wear lens glasses, it’s best to switch to contacts before you go in the water. There are two different camping grounds inside Thingvellir National Park near Silfra fissure. One is located next to the Information Center and the other one is at Vatnskot. Both camping grounds are open from the 1st of June to the 1st of October. GPS; N 64°16’48.9426″ W 21° 5’17.4444″. The Leirar campground is split into four different camping grounds: Fagrabrekka, Sydri-Leirar, Hvannabrekka, and Nydri-Leirar. Silfra Fissure is located within Thingvellir National Park, a UNESCO site and a must-visit place in Iceland. The whole area is within 50 kilometers from the capital and only a 45-minute drive from Reykjavik. You can go snorkeling and sightseeing in the area on a day tour. Besides, Silfra is neatly located close to multiple highlight attractions in Iceland, it would be impossible to miss other wonderful sights. The pure glacial water coming into Silfra Fissure eventually flows into Thingvallavatn (Þingvallavatn in Icelandic), the largest natural lake in Iceland. Thingvellir National Park is on the lake’s north shore and is one of the three amazing attractions in the renowned Golden Circle. 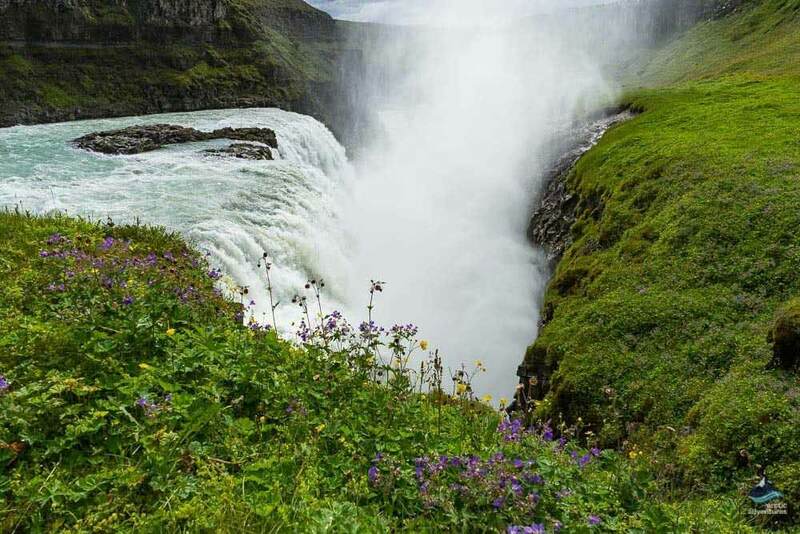 In addition to the National Park, the mighty Gullfoss waterfall is another attraction in the Golden Circle and it’s listed as one of the top 10 waterfalls in the world by World of Waterfalls. The most dynamic and lively spots in the Golden Circle are the Great Geysir and Strokkur natural hot springs. They have completely different temperaments but are equally astounding when you see them gush up into the sky. 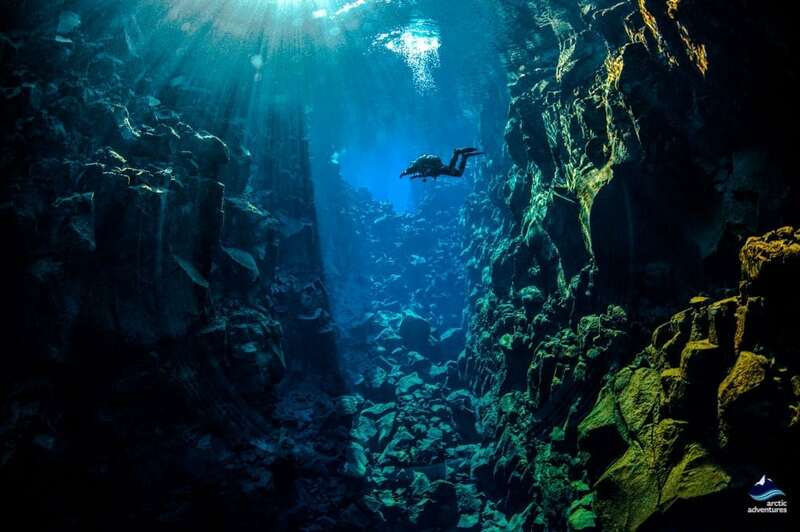 Since Silfra Fissure is within the Golden Circle, people usually plan a day trip to this area in which they always add a snorkeling or diving activity to enrich the itinerary and experience something unique. There are tours departing daily from Reykjavik that offer free pickups at most hotels and hostels. How far is Silfra from Reykjavik? Silfra is about 55 km (34 mi) from Reykjavik, which means it’ll take you less than an hour to drive there. We advise you to have a look at this map beforehand. What is the Silfra fissure? Silfra is a fissure between the North American and Eurasian tectonic plates in Thingvellir National Park that was formed in 1789. 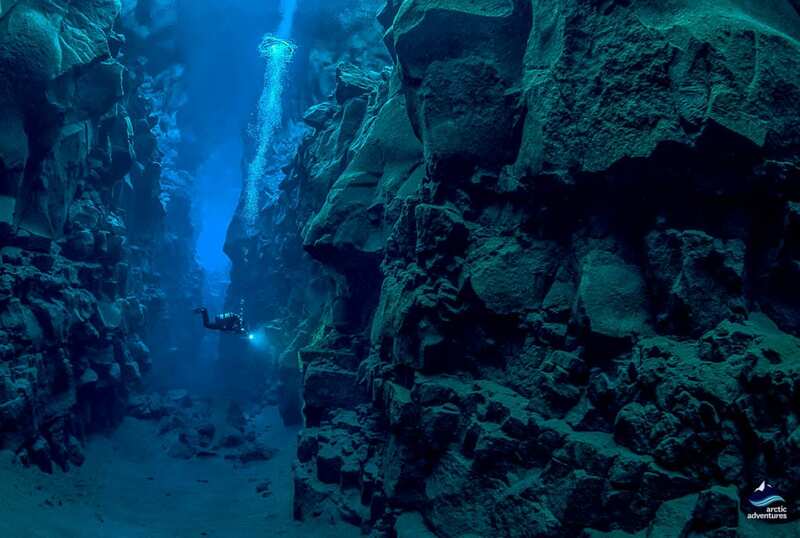 It’s the only place in the world where you can dive or snorkel between two tectonic plates, which drift apart at a rate of about 2 cm a year. Silfra is located in Thingvallavatn (or Þingvallavatn), the lake at Thingvellir National Park. The water temperature is stable 2 – 4°C (35 – 39°F) all year round. The water comes from the Langjökull glacier which keeps it cool and very refreshing! Can I drink water from Silfra? Yes! The water in Silfra originates at Langjokull Glacier and is filtered through lava rock. 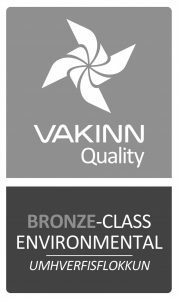 This means that the water in Silfra is rich with volcanic minerals and is absolutely pure. Feel free to have a sip of some of the purest water in the world! There is no food sold directly at Silfra. However, you can find a restaurant at the Thingvellir Information Centre, which is just 3.5 km away from Silfra. What is the depth and dive time when diving/snorkeling in the Silfra fissure? The maximum depth we are allowed to go to in Silfra is 18 meters. Most of the dive is spent at a shallower depth due to the topography of the site. The dive time is about 30-40 minutes per dive. When is the best season to dive? The Silfra fissure is a great dive site all year round. It can be a little colder in the winter, but it is still an amazing experience! Our other dive sites are available May-September. Can I snorkel/dive on my own? 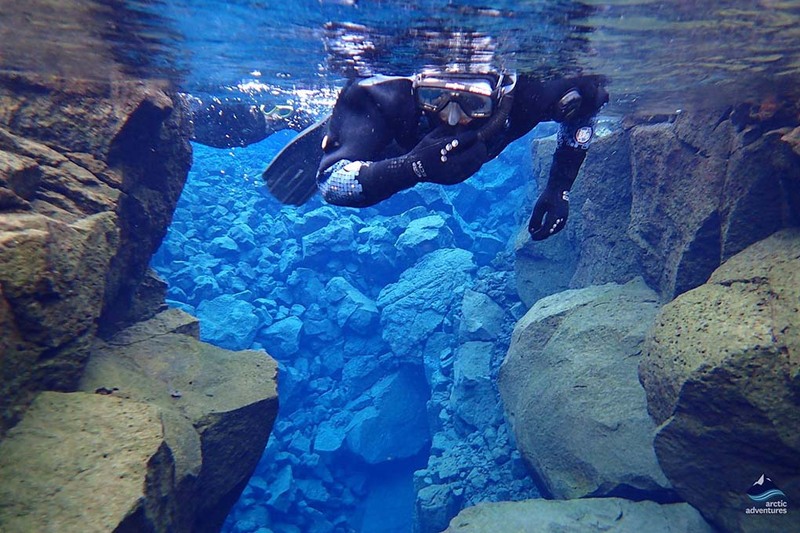 Even though almost everyone can snorkel in Iceland, divers need to be experienced in dry suit diving and have certification (PADI Open Water Scuba Diver or equivalent, depending on the diving site). 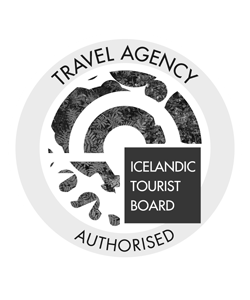 However, it’s recommended that those interested in diving/snorkeling in Iceland take guided tours from registered tour operators. 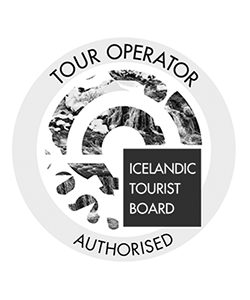 If you set out to explore Iceland, you’ll see and do much more with our certified expert guides, than you would on your own. And most importantly, you’ll do it safely! We will need to see proof of your certification. If you do not have your card, please contact us well ahead of your tour and we might be able to find you in the PADI Open Water Scuba Diver online database (if you are certified with PADI). If you come to the diving tour without your card, unfortunately. we will not be able to take you diving.